Gives“swee-ee-ee” call while perched. Song is medley of twitters and trills. 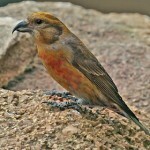 Description: Red to orange-red cap and black chin. Usually has distinct streaks on flanks, rump, and undertail coverts. Grayish-brown above; two thin white wing bars. 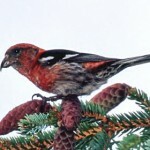 Breeding male has rosy breast and sides, and brown streaking on back of head. Breeding female lacks rosy breast, and has solid brown back of head. Both sexes are paler overall in winter. Juveniles are paler overall and are heavily streaked with brown; lack red cap. Behavior: Forms large flocks during the winter. Flight is undulating. Habitat: Found in conifers, deciduous thickets, weedy fields, and will occasionally visit residential bird feeders. 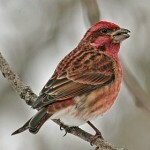 Where in Nebraska: Occasional winter visitor across the state. Locally common in some winters and absent in others. 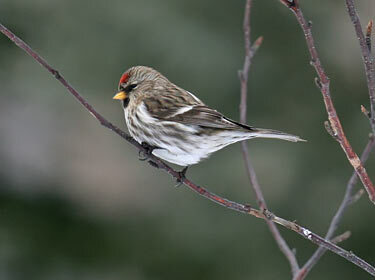 Fun Facts: Common Redpolls have special throat pouches they use to quickly store lots of seeds and then fly away to swallow the seeds in safety.